Dubai: They are, with no hyperbole at all, one of the world’s biggest bands, with not only massive records and tours to their name, but a history that counts music’s most rock’n’roll moments. All said, a certain amount of rock-star loftiness would be expected from a member of the Rolling Stones. 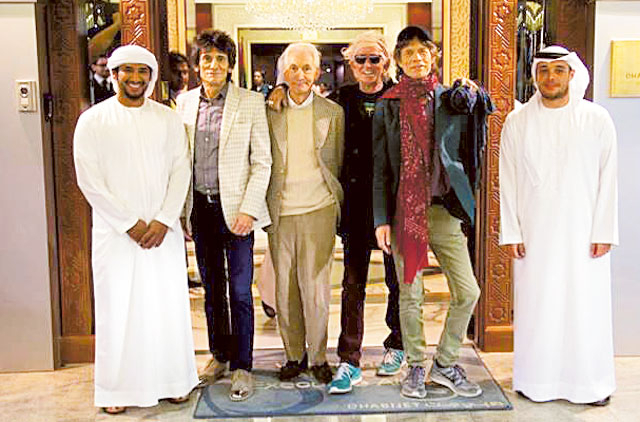 Not Ronnie Wood, though, as an interview ahead of the band’s Abu Dhabi debut this Friday shows. Wood and Taylor, who has returned to the band for this tour, will share the stage on Friday at du Arena when the band play their sold-out concert in the UAE, a milestone as it’s not only their first show in the UAE — it’s also the first date on their 14 On Fire tour, which takes them along with Mick Jagger, Keith Richards and Charlie Watts across the Far East and Australia. The band landed in the capital on Monday — after flying in on their own plane — from Paris, where they’ve been holed up in rehearsing dozens of songs in preparation for the tour, Wood says. Q: How are the rehearsals going? A: We are staying in town at the George V hotel, but we rehearse about 40 minutes away in an area called Bondy, in a warehouse. It’s a lovely soundstage and quite a big room so we get a feel for how the fans will see us on stage. Q: When was the last time you were all on stage together? A: On stage at Hyde Park, we did two there [in July 2013] and we did Glastonbury [festival], so it was a fantastic summer for us. Q: It’s the start of a big year, with 14 On Fire. A: And Abu Dhabi, where I’ve never been. I’ve been to Dubai and Qatar, because I thought I was going to buy a guitar there. Q: You’ve just got a new Gibson though — how many guitars do you need? A: I have, I’ve been trying it out at rehearsals and it sounded good. Q: You’ve still got your own brand of guitars? A: Yeah this is a new one from my own brand, coming out soon. Q: You’ve played nearly every venue possible in the world. What’s the buzz about Abu Dhabi within the band? A: It’s excitement of the unknown. Who knows if they’d even know who we are there. It’s like in China, I’m sure they don’t know what they are looking at, but we hope to turn them on through the music. Q: There’s a Rolling Stones earthquake going on here at the moment! Q: When you’re not on the road, are you at home, looking at the front door with the bags packed, waiting for a call from the boys? A: I am like a fish out of water but luckily I have my other release, which is painting and drawing, which I do a lot of. Even here in Paris, I am painting away. Q: And watching lots of TV shows by the looks of it? A: Yeah, we are on The Bridge second series. I’ve done everything else — The Spiral and The Killing — all of the crime murder mysteries, we love that. There’s nothing like a good murder to keep you on your toes. Q: When you come to our capital, what are you hoping to celebrate? A: A new enlightenment, and a new buzz from a different kind of audience, especially in the early stages. I’m looking forward to going back to Japan and Singapore and Australia — we haven’t been there for a long time. The Far East — Macau and Shanghai — are going to be interesting. Q: You’ve been in the band since the mid-1970s. Do the band still treat you as the new boy? A: We’re getting over that now. I’m actually being treated as a principal by them, I think they realise I’m here to stay [laughs]. I start bossing them around now. Q: Is it difficult for you to make a transition between your solo work and your work with the Stones? A: It’s a bit like my art, really, I’m the one to blame for something I do on my own, like a solo album or a painting. But it’s good fun, it’s another angle to fill the time between Stones gigs, because that comes first. Q: Does your solo work help keep the Stones fresh? A: Yeah, it does, and it gives you a chance to do other ideas you wouldn’t do with the band. Q: Tell us about how you feel playing songs like Satisfaction? A: Funnily enough, each number, especially songs like Satisfaction, takes on a different guise. Each time, we try and play it differently, and better than the last time. It’s a learning process. Q: Which songs have a real meaning for you, when you can place yourself at a certain time or in a big arena, and say, ‘those weren’t bad days’? A: That’s right, going back to Rod Stewart days, when we made Maggie May, that brings back so many memories of that time. 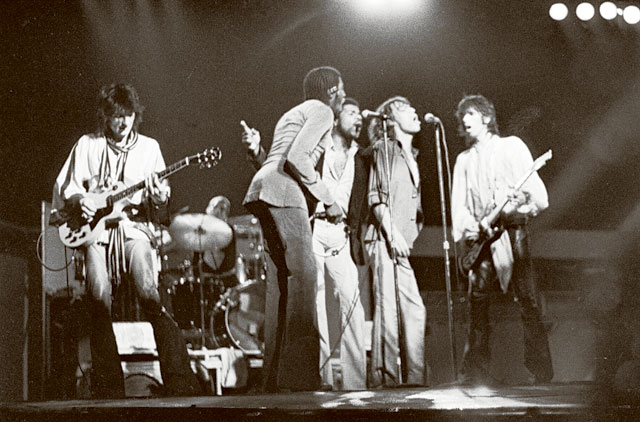 Songs like Miss You do when I’m with the Stones. Q: For me, the Stones have always been about new music, keeping it fresh and always finding something new, inheriting a new audience along the way. Is that a frustrating thing? Do you look at new music today and wonder, where is the new generation coming from? A: Yeah it is a bit of a mystery. I’m always keeping my fingers crossed that something of the ilk of The Beatles or the Rolling Stones will come along again. But as long as they stay true to their roots and try to play as much live music as possible — because pre-recorded stuff is not rock’n’roll. A: Oh yeah, One Direction, they’re my mates. I make an exception with them — they’re good boys. 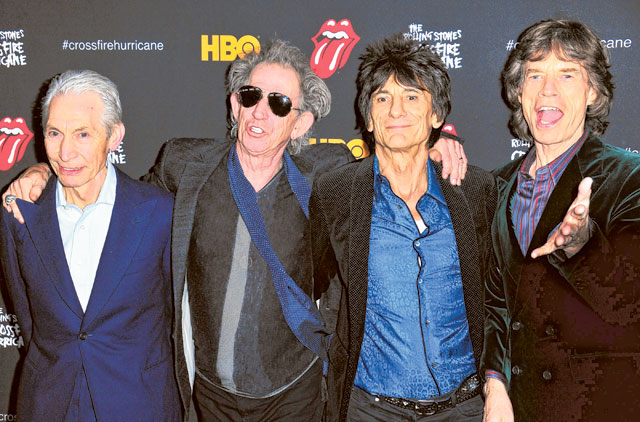 Q: What’s the future for the Stones after this — or is that too far ahead to think about? A: We’re just taking it one leg of the tour at a time, and we hope — well, the band is getting better and better all the time. We ended on a high at Hyde Park, the band has never sounded better, and we’ve never had such a good thing going between us. We’ll just develop it as we go along. Q: How do you put a set list together? A: With great difficulty! [Laughs]. Q: What about a new album? A: I don’t know — we’ve got to get these gigs over first. Q: Would you do a live album? A: That’s up to Mick, the way he feels. Sometimes we do duets with different rock artists over the world, and I think that’s in the back of his mind, to make an album with some of the guests we have. Q: So no chance of the Stones getting off the bus? A: No. We’re going to get off the bus anytime soon. Q: And you, still a gypsy? A: Always a gippo at heart mate. I’ve got my Sally with me here, keeping me strong. As you say, happy days.